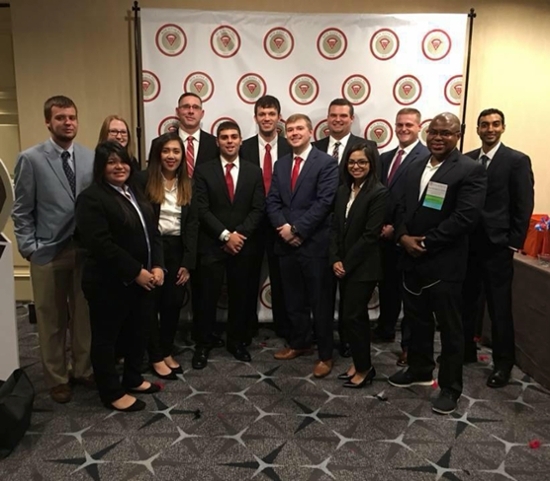 VSU’s Mu Zeta chapter of Beta Alpha Psi attend the 2018 Beta Alpha Psi Annual Meeting in Washington D.C. Pictured, from left to right, are (front row) Silvia Chihuahua, Joyce Pickard, David Hanna, Cody Crance, Victoria Stewart, and Dr. Ray Elson (faculty advisor); (back row) Andrew Meier, Erin Boyd, James Stogin, Adam Mobley, Michael Keesling, Chandler Feimster, and James Rasalam. VALDOSTA — Valdosta State University’s Mu Zeta chapter of Beta Alpha Psi was recently recognized as a Superior Chapter by the Beta Alpha Psi Board of Directors for the ninth consecutive year. The Mu Zeta chapter was granted the designation as a result of its work and achievements during the 2017-2018 academic year. Chapter members achieved an average of 32 professional and service hours and completed specific activities outlined by Beta Alpha Psi, an international honor organization for financial information professionals and students. Notable service events from the 2017-2018 academic year include chapter members presenting on their college experiences and the accounting profession to Lowndes High School students. They also continued to host the annual Accounting Principles Honors Luncheon and the Meet the Firms events. The Mu Zeta chapter actively participates in the regional and annual meetings, with members presenting on chapter activities during these meetings. During last year’s annual meeting, held in Washington D.C., chapter members participated in the “day of literacy” service project. A chapter member was selected as one of 72 individuals from around the country to participate in the Project Run With It (PRWI) Competition during the annual meeting. PRWI participants serve as consultants to a specific nonprofit organization and must develop and present a solution to the organization within 36 hours. “I am proud of the members for their dedication and willingness to participate in the events that allowed the Mu Zeta chapter continue to earn this level of achievement,” said Dr. Raymond Elson, professor of accounting and chapter faculty advisor. The chapter is currently preparing for Beta Alpha Psi’s Southeast Regional Meeting in Jacksonville, Florida, from Feb. 22-23, where it expects to compete in the three best practices competition and present in a chapter operations session. VSU’s Mu Zeta chapter of Beta Alpha Psi is committed to promoting the study and practice of accounting and finance; providing opportunities for self-development, service, and association among members and practicing professionals; and encouraging a sense of ethical, social, and public responsibility. The chapter was founded in 2007. Beta Alpha Psi is comprised of more than 300,000 members and 300 collegiate chapters that seek to encourage and recognize scholastic and professional excellence in the business information field. Membership is only available to universities accredited by the Association to Advance Collegiate Schools of Business or the European Quality Improvement System. Accounting and finance majors at VSU may join the Mu Zeta chapter of Beta Alpha Psi as candidates as early as their freshman year. Candidates are eligible for membership after completing an upper level major course, attaining a major and overall GPA of 3.0 or higher, and completing the chapter's professional and service hour requirements. The VSU chapter meets at 5 p.m. every Thursday in Health Sciences and Business Administration Building. Please contact Dr. Raymond Elson at (229) 219-1214 or relson@valdosta.edu to learn more.